In Brazil two former executives of arms company Forjas Taurus are accused of diverting 8,000 small arms in 2013 to Yemen. The prosecutor claimed that the defendants committed fraud by disguising the final destination of the weapons, and also tried to hide the identity of the arms broker. The arms broker Fares Mohammed Hassan Mana’a had been put on a UN sanctions list in 2010 for violating the UN arms embargo against Somalia. The prosecutors claim that the ties between Taurus and Mana’a stretch back to 2007. Taurus denies any involvement and puts all blame on its executives. It is further alleged that Taurus received regular payments from Mana’a since 2013 for the 8,000 small arms. Furthermore in January 2015 Mana’a visited Taurus under a false identity to negotiate a further shipment of 11,000 small arms. Reuters further reports that in May 2015 a Brazilian federal judge overseeing the case decided that Brazil’s foreign ministry, the United Nations, Interpol and others should be notified. But surprisingly two days later Taurus won an injunction from an appeals court blocking the federal judge’s decision… It is not clear if Taurus itself is under investigation. Earlier in the year Streit Group, a Canadian owned company, had come under fire by the United Nations Expert Panel on Libya for delivery of armoured vehicles from its factory in the United Arab Emirates to Libya. Recent documents obtained by the Globe and Mail reveal that the Streit Group, from its UAE factory, has also sold armoured vehicles to Sudan, despite Canadian and United Nations arms embargoes. The UN arms embargo on Sudan allows the transfer of military equipment if the UN Security Council is notified and has authorized the transfer. The Canadian arms embargo on the other hand prohibits the export, sale, supply or shipment of military equipment by citizens in Canada or Canadians overseas. CBC reported that in a confidential report the UN Expert Panel on Sudan had accused the Streit Group of “deliberately skirting” long-standing arms embargoes against Sudan. The UN Panel reported, so it seems, anomalies with the end-use(r) documentation. More diversion news from Somalia. Diplomats claim that UN approved imported firearms are being resold on the black market. In 2013 an exemption of the UN arms embargo on Somalia was included which allowed for the transfer of weapons to the Transitional Government if the Security Council is notified, and on the condition that the weapons are traceable. 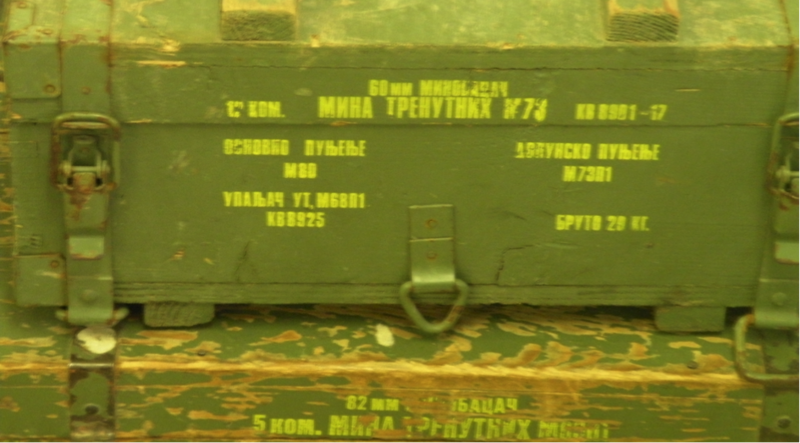 Meanwhile it is estimated that only +/- 35% of the imported arms are marked, and “neither paper records nor the markings showed which weapon was issued to which individual”. The question remains how a non-existent administration would be able to account for any item under its alleged ‘control’? Le Traité sur le Commerce des Armes (TCA) existe. Les signataires se sont retrouvé à Genève fin août pour lui donner un nouvel élan, depuis son entrée en vigueur en décembre 2014. Durant son séjour à New York, en marge de sa participation au débat général de la 71ème Assemblée Générales des Nations Unies, le Président de la République de Madagascar a procédé à la signature du Traité sur la règlementation du commerce international des armes classiques (TCA). La circulation des armes de petit calibre, un véritable casse-tête pour la stabilité du monde et de l’Afrique. Selon Marc Finaud, conseiller principal du programme Nouveaux défis de sécurité, actuellement à Dakar pour les besoins d’une formation en développement des capacités pour une mise en œuvre efficace du traité sur le commerce des armes. Israel sold rifles to Uganda in 2007, which the latter transferred to South Sudan’s national security service in 2014, the United Nations said in a report. The South Sudanese military is now operating two Aero L-39 Albatros jets, its first fixed-wing combat aircraft, according to a confidential UN report seen by Reuters. Dans un rapport rendu public jeudi, Amnesty International accuse le gouvernement soudanais d’avoir utilisé des armes chimiques présumées contre la population de la région du Jebel Marra au Darfour au cours des huit derniers mois. “Le rapport d’Amnesty est incorrect”, s’est contenté de répondre le régime. UN peacekeeping chief Herve Ladsous is pleading with the Security Council to impose an arms embargo on South Sudan where he expects an upsurge in fighting with the coming end of the rainy season. A UN panel of experts has found evidence of “well-established networks” of arms suppliers in Eastern Europe and the Middle East that are fueling the war in South Sudan. The second of Egypt’s two Mistral-class landing helicopter dock (LHD) amphibious warfare vessels, ENS Anwar el-Sadat (L 1020), was handed over to the Egyptian Navy in the French port of Saint-Nazaire on 16 September. L’armée marocaine serait en discussions très avancées avec la Russie pour l’acquisition de sous-marins russes « Amur 1650 » à propulsion diesel-électrique et du chasseur-bombardier tactique sukhoi-34, rapporte l’agence de presse russe Tass, citée par Defense World. En Egypte, le chantier pour la construction de quatre patrouilleurs français est à l’arrêt. L’armée a voulu faire taire les critiques sur les conditions de travail du sous-traitant : 26 salariés risquent la cour martiale. Bien que la Libye soit frappée d’un embargo sur les armes, un représentant de l’armée libyenne a décidé de demander à la Russie de réviser l’interdiction et de reprendre les livraisons de matériel militaire. Egypt will receive a submarine from Germany in early 2017, Egyptian Navy Commander Ossama Rabie announced on Thursday. Les exportations allemandes d’armes à destination de l’Algérie ont atteint 4,029 milliards d’euros en 2016, dévoile le site d’information allemand Deutsche Welle. Une appétence que seule la rivalité avec le Maroc pourrait expliquer. Eclairage. The delivery of the first of Zambia’s new HAIC L-15 multirole jet fighters was confirmed during the Africa Aerospace & Defence (AAD) exhibition held in South Africa from 14-18 September, when two were displayed at the show. En Afrique du Sud, le Salon de l’Aéronautique et de la Défense africaine ferme ses portes le 18 septembre. L’AAD, l’Africa Aerospace Defence, est le plus gros salon du continent dédié à cette industrie, avec plus de 400 exposants. Two non-government organisations – Corruption Watch and the Right2Know (R2K) Campaign – have applied to the North Gauteng High Court to set aside the findings of the Arms Procurement Commission. South African defence equipment manufacturer Denel Dynamics has reportedly signed a memorandum of understanding (MoU) with Saudi Arabian firm ITAEC Group to potentially manufacture anti-tank missiles in the country. Nigeria has signed a memorandum of understanding covering the sale of the joint Pakistani-Chinese PAC/CAC JF-17 Thunder multirole fighter and a contract is expected to be finalised by November, a senior official from the Pakistan’s Defence Export Promotion Organization (DEPO) told IHS Jane’s during the Africa Aerospace and Defence (AAD) show held in South Africa from 14-18 September. Nigeria’s former national security adviser, held since December 2015 on fraud charges, should be released, a judge at the court of the Economic Community of West African States (ECOWAS) ruled Tuesday, saying his detention was unlawful and arbitrary. Les experts sur la lutte contre les trafics d’armes et les spécialistes de l’Office fédéral allemand de l’Economie et du contrôle des exportations (BAFA) travaillent actuellement à Lomé sur le texte d’un avant projet de loi destiné à mieux réglementer le contrôle des armes et munitions. Fresh indications have emerged that the ex-National Security Adviser, Col. Sambo Dasuki, who is standing trial for alleged mismanagement of $2.2 billion arms funds, would like former President Goodluck Jonathan to be his witness. As US State Department officials try to convince foreign nations to sign on to a new set of guidelines for the export and use of armed unmanned systems, experts are split on just what the impact such new rules might have on the growing market for strike-capable drones. Production of the controversial, internationally banned weapon in the United States will end—for now. Le groupe américain Textron, qui est le dernier fabricant de bombes à sous-munitions aux Etats-Unis, a décidé de mettre un terme à cette activité, cédant ainsi à la pression des organismes de défense des droits humains, qui militent pour l’élimination de ce type d’armes. America is poised to sell $7 billion worth of fighter jets to Qatar and Kuwait despite concerns that they may be used to attack Israel. Brazil’s Defense Ministry said on Monday it had authorized gun maker Forjas Taurus SA to export arms to Djibouti in recent years, but that those weapons could not be legally re-exported to other countries. A Canadian-owned company has sold 30 armoured vehicles to Sudan, newly obtained documents show, despite Canadian regulations that ban the export of military and paramilitary equipment to the war-torn country. Brazilian prosecutors said on Tuesday they had charged Forjas Taurus SA, Latin America’s largest gun maker, in May for dealing with a known Yemeni arms trafficker in violation of international sanctions, prompting the company’s shares to plunge. Rival combat system integrators bidding to upgrade the Chilean Navy’s three Type 23 frigates have presented the service with combat system modernisation solutions using either the Israel Aerospace Industries (IAI) Barak-8 or the MBDA Sea Ceptor anti-air guided weapon systems, IHS Jane’s has learned. The RCMP has been probing a Canadian-owned company for more than three months over its sales of armoured vehicles to war-torn Libya despite a ban on military exports to that country – a review that now has been expanded to include shipments to Sudan. The Obama administration followed up a planeload of $US400 million in cash sent to Iran in January with two more such shipments in the next 19 days, totalling another $US1.3 billion, according to congressional officials briefed by the US State, Treasury and Justice departments. The top Democrat on the US Senate Foreign Relations Committee said he will not back a proposal to block a $1.15 billion arms sale to Saudi Arabia over its war with Yemen. As part of the U.S. export control reform process, the Department of Commerce’s Bureau of Industry and Security (BIS) and the Department of State’s Directorate of Defense Trade Controls (DDTC) recently issued final rules to harmonize the destination control statement (DCS) for items subject to the Export Administration Regulations (EAR) and International Traffic in Arms Regulations (ITAR). Does the vote to allow the families of terrorist victims to sue Saudi Arabia mean an end to a proposed $115 billion arms sale? Ce protocole d’accord “constitue le plus important engagement d’assistance militaire bilatérale dans l’histoire des Etats-Unis”. A former Italian politician was sentenced on Thursday to four years in a U.S. prison for conspiring with others to sell $15 million worth of weapons to undercover informants posing as Colombian rebels. Rekord: Regierung Obama verkaufte dem Golfstaat Kriegsmaterial um 115 Milliarden Dollar. The US Senate scuttled a measure to block the $1.15 billion sale of US tanks to Saudi Arabia, though a Hill fight is looming over another measure the kingdom dislikes. The completion of a US weapons deal with Israel worth $38 billion clears the way for two of Israel’s Arab neighbors to buy US fighter jets. Washington envisage de fournir des armes aux Kurdes syriens qui participeront à l’offensive pour reprendre Raqa, le bastion du groupe Etat islamique (EI) en Syrie, a indiqué aujourd’hui le plus haut gradé américain. Le plan du gouvernement libéral de fournir des armes aux forces kurdes en Irak est freiné par des craintes de voir l’équipement militaire être utilisé à des fins autres que celle de combattre Daech (le groupe armé État islamique). Nach dem angedrohten Abbruch der Syrien-Gespräche verschärft sich der Ton zwischen den USA und Russland weiter. Berichte über mögliche US-Waffenexporte kontert Russland mit heftiger Kritik – und stellt klar, dass es keine einwöchige Waffenruhe geben wird. Brazil is reviewing its procedures for controlling arms exports, Defense Minister Raul Jungmann said on Thursday, when asked about an investigation into a sale of guns by Forjas Taurus SA that allegedly violated U.N. sanctions. Le gouvernement Trudeau a signé l’arrêt de mort d’une motion du NPD qui visait à créer un comité pour examiner les exportations d’armes du Canada, dont la vente de véhicules blindés à l’Arabie saoudite. The Trudeau Liberals voted down a motion to give MPs a key role in scrutinizing foreign exports of Canadian military goods, saying this level of parliamentary oversight was unnecessary. Le Canada s’est joint à des dizaines d’autres pays en appelant à des règles plus claires sur la vente et l’usage de drones armés, alors même que le gouvernement fédéral tente de déterminer si l’armée canadienne devrait acquérir de telles armes. The US might approve an arms sale package to Taiwan before US President Barack Obama’s term expires in January next year, Deputy Minister of National Defense Lee Hsi-ming (李喜明) said yesterday. More than 40 nations have joined the U.S. in a joint declaration aimed at controlling exports of armed or weapons-capable unmanned aerial vehicles (UAVs). Major UAV-producing nations such as Israel, Russia, China and India are not among signatories to the declaration of broad principles, which is a precursor to setting more detailed standards. The US State Department and US Department of Commerce released revisions to the definitions they apply to the export of fire control, laser, imaging, and guidance equipment on 12 October. As Brazil weathers the worst political and economic crises in living memory, Brazilians can hardly be blamed for being distracted. But there is a subject that the country’s politicians — and citizens — are not discussing, even though it risks tarnishing Brazil’s international reputation as an advocate of peacebuilding and diplomacy: an unchecked arms industry and its involvement in foreign conflicts around the globe. Russian trafficker dubbed ‘Merchant of Death’ seeks new trial, alleges co-conspirator was government informant. The United States has flooded Iraq and Afghanistan with billions of dollars worth of small arms since the terrorist attacks of Sept. 11, 2001, and has lost track of millions of them, according to a recently published report on 412 Department of Defense contracts by the London-based advocacy nonprofit Action on Armed Violence. Deux Américains d’origine arménienne, Zavik Zarkarian (52 ans) et Vatché Naïrian (57 ans) encourent près de 100 ans d’emprisonnement s’ils sont reconnus coupables d’avoir livré à l’Iran du matériel militaire alors que Washington avait mis Téhéran sous embargo. La Convention sur les armes à sous-munitions interdit complètement ces armes et exige la destruction des stocks dans les 8 ans. South Korean shipbuilder Hyundai Heavy Industries (HHI) has formally received a notice of award from the Philippine government to build two new frigates for the Philippine Navy (PN). India intends to buy the export version of Russia’s Kalibr land-attack cruise missile equipped with the latest high-precision guidance system, Russian newspaper Izvestia reported on 1 September citing a diplomatic source. India said on Saturday it is giving Vietnam half a billion dollars in credit to boost defence ties, the latest security deal between the two nations seeking to counter Beijing’s muscle-flexing in the South China Sea. Qatar has just signed a deal to install a defense system along its coast to help stop hostile ships entering its territorial waters. The move is part of reforms aimed at boosting Israeli defense sales to the international market. Vietnam and France have agreed to expand collaboration on defence trade and related industrial engagement. The accord was signed during French president Francois Hollande’s visit to Hanoi, which concluded 7 September. In den Bürgerkriegsländern Syrien und Jemen werden nach Angaben internationaler Organisationen immer wieder Streubomben eingesetzt. Etwa 350 Menschen – zumeist Zivilisten – sollen 2015 in diesen beiden Ländern den besonders heimtückischen und grausamen Waffen zum Opfer gefallen sein. Philippines President Rodrigo Duterte has outlined an intention to procure military equipment from Russia and China. His statement signals a shift away from the Philippines’ traditional military dependency on the United States. The Iraqi Army is in the process of certifying BAE System Advanced Precision Kill Weapon System (APKWS) on its Bell IA-407 helicopters, Steve Suttles, Bell Helicopter vice-president for Middle East and Africa, told IHS Jane’s during the Africa Aerospace and Defence (AAD) show held in South Africa on 14-16 September. The Philippines may acquire military equipment and technology from Russia to boost its campaign against terrorism, transnational crimes and the threats to it in the disputed South China Sea, Foreign Affairs said Wednesday. Armenia paraded newly-acquired weapon systems, including 9K720 Iskander (SS-26 ‘Stone’) short-range ballistic missiles (SRBMs), during its Independence Day parade on 21 September. World’s biggest arms importer agrees to buy 36 jets, ending 18 months of wrangling over terms. Indian defence company Larsen & Toubro (L&T) has signed a contract with the Indian Ministry of Defence (MoD) to supply high-speed patrol vessels to the Vietnam People’s Army’s paramilitary Border Guard Force. The Indonesian Air Force (Tentara Nasional Indonesia – Angkatan Udara, or TNI-AU) has taken delivery of a further five F-16C/D fighter aircraft from the United States. Indien will die Abhängigkeit von ausländischen Rüstungsgütern verringern. Doch liegen Anspruch und Wirklichkeit noch weit auseinander. Small Australian manufacturers are on the cusp of a golden ­opportunity to seize a greater part of the multi-billion-dollar global defence industry, according to global defence giant BAE Systems. Saudi-Arabien erwartet von der Bundesregierung die Genehmigung eines lange vereinbarten Rüstungsexports der deutschen Waffenschmiede Heckler & Koch. CBI claimed on Wednesday that it has managed to track down a middleman, a foreign national, who was allegedly paid $5.5 million as commission by Brazilian company Embraer to bag a Rs 1,350 crore ($208 million) jet deal with India in 2008. The Obama administration has told Congress it won’t complete approval for Bahrain to buy as many as 19 F-16 fighter jets from Lockheed Martin Corp. and upgrades for older ones for almost $4 billion until the Gulf ally demonstrates progress on human rights, according to people familiar with the issue. L’opposition syrienne a regretté aujourd’hui à Ryad de “ne pas avoir reçu d’armes anti-aériennes” pour lutter contre les raids du régime et de la Russie, après l’échec des tentatives diplomatiques pour faire cesser les combats à Alep. It is still unclear what missiles and target acquisition systems the Yemeni rebels are using. AFP cited an unidentified senior defence official as saying they are believed to have a type of the Chinese-made C-802 anti-ship missiles. Qatar has expressed its interest in looking into the development of military equipment manufactured by three Indonesian state-owned enterprises, namely PT Pindad, PT Dirgantara Indonesia and PT PAL, a top diplomat has said. South Korea has received its first lot of Taurus KEPD 350K cruise missiles during a ceremony at the headquarters of Taurus Systems in Schrobenhausen, Germany, it was announced on 14 October. L’Iran a demandé d’entreprendre des actions pour que soit réalisé le “désarmement nucléaire” d’Israël. The first-ever defense deal between India and Japan is back on track after two years as Japan has offered a price concession for the purchase of 12 US-2 amphibious aircraft for the Indian Navy, according to an official with the Indian Ministry of Defence (MoD). The Lebanese army on Wednesday received a quantity of ammunition that have been granted to Lebanon by the Belgian authorities, state-run National News Agency reported. German-made Dolphin-class submarines would replace aging boats serving in Israeli Navy since the 1990s. Holding that Brazilian aviation major Embraer cannot escape Indian laws just because it has now arrived at a settlement with US authorities, defence minister Manohar Parrikar said on Tuesday that CBI will continue with its probe into allegations of kickbacks+ being paid by the company to swing a $208 million deal with India in 2008. Die indische Luftwaffe ist veraltet und kaum einsatzbereit. Um die Lücken zu schließen, machen die Militärs nun Druck: Sie wollen so schnell wie möglich Dutzende Jets kaufen. Rüstungsfirmen könnten dabei groß Kasse machen. The Philippines has invited Japanese companies to invest in its defence industry as a means of strengthening strategic relations as well as boosting domestic capabilities. India seeks to modernise weaponry and other accessories of the Indian Army’s Infantry forces. Pakistan has offered Qatar all possible technical assistance for setting up military hardware production facilities on Transfer of Technology (ToT) basis as Prime Minister Nawaz Sharif said Pakistan, Qatar and Turkey can set up joint ventures for undertaking defence related manufacturing. Indian Air Force needs to make for sharply declining combat squadron strength, from the sanctioned 45 to current 32. More than 900 Chinese weapons will be on display at Zhuhai air show, but it still trails US and Russia in global market share. n Oct. 26, the Israeli Cabinet secretly authorized a huge weapons transaction that developed under the radar over the recent year: Three additional Dolphin-class submarines will be purchased from a German shipyard in the port city of Kiel. Une contestation judiciaire par une société concurrente est susceptible de retarder la location de drones. The Liberal Democrats have proposed a new law to create a register of arms dealers in Britain. The Lithuanian Ministry of Defence signed a EUR12.5 million (USD14 million) contract on 29 August for the delivery of a large quantity of G36KA4M1 rifles and HK269 grenade launchers from Germany’s Heckler & Koch (H&K). All weapons are scheduled to be delivered to the Lithuanian armed forces in 2017. Nine Lithuanian citizens have been arrested as part of an international operation in Lithuania, suspected of ties to terrorism and arms smuggling, in addition to another 15 Lithuanians caught in Spain. Kann ein neuer Rüstungswettlauf in Osteuropa noch verhindert werden? Bundesaußenminister Steinmeier will zumindest den Versuch wagen. Doch aus dem Baltikum kommt schroffe Ablehnung. Le déploiement de l’artillerie française mise à disposition de l’armée irakienne est en cours, a annoncé aujourd’hui Jean-Yves Le Drian, qui a confirmé le déploiement prochain du porte-avions Charles de Gaulle sur le théâtre irako-syrien, où il apportera son soutien aérien aux forces combattant l’Etat islamique. Der litauische Staat kauft für 12,5 Millionen Euro weitere G36-Sturmgewehre des deutschen Waffenherstellers Heckler & Koch. Trotz der schlechten Rufes hat das litauische Militär großes Vertrauen in das Gewehr aus Deutschland. Le ministre-président flamand Geert Bourgeois a donné le feu vert à un contrat d’exportation de composants d’armement vers l’Arabie saoudite, en particulier des viseurs. Le sujet est sensible alors que l’Arabie saoudite est un acteur essentiel des conflits qui se jouent au Moyen-Orient, berceau du terrorisme islamiste. Polish government in final stages of negotiation with arms manufacturer Raytheon to buy eight of its missile defence systems. Russia’s Rosoboronexport, the country’s main arms exporter (controlling roughly 85% of all defence-related sales), has this year sold weapons and military equipment abroad worth USD7 billion, deputy director general of the company Sergey Goreslavsky told RIA Novosti on 7 September. Russia’s ongoing “Army 2016 International Military-Technical Forum” being held at the town of Kubinka outside Moscow is seeing a lot of big business deals that could benefit Russia’s crippled economy. Czech small arms manufacturer Ceska Zbrojovka Uhersky Brod has signed a contract with Peruvian military-owned small arms producer FAME to assemble and maintain semi-automatic pistols at the latter’s facility in Lima. Die Hersteller DCNS aus Frankreich und TKMS aus Deutschland liefern sich im globalen Rüstungsgeschäft einen Schlagabtausch, der einem packenden Wirtschaftskrimi ähnelt. Länder, die die sich nicht von den USA oder Russland abhängig machen wollen, können mit dem Gripen E aufrüsten. Brasilien feiert die partnerschaftliche Zusammenarbeit und Indien denkt über eine Riesenbestellung nach. Lithuania’s Foreign Minister Linas Linkevicius has voiced a cautious view of an idea suggested by his German counterpart, Frank Walter Steinmeier, to develop new international pacts on arms control in response to increased strain between NATO and Russia. Airbus opened a new plant to produce the H215 helicopter in Romania on Tuesday, a €50 million (Dh206.1m) investment which the French president François Hollande said fits into efforts to promote European defence cooperation. The commitee is split into three factions and its consituent parts have released two reports. Les navires de l’opération européenne en Méditerranée (EUNAVFOR Med / Sophia) ont commencé à assurer leur nouvelle fonction de contrôle de l’embargo des armes au large de la Libye. Rosoboronexport, l’agence russe chargée des exportations du complexe militaro-industriel russe, a exporté pour plus de 21 milliards de dollars d’armes vers l’Afrique depuis sa création en novembre 2000, a rapporté l’agence de presse russe TASS le 13 septembre. Bundeswirtschaftsminister Sigmar Gabriel will eine „Kommission zur Zukunft der Rüstungsexportkontrolle“ einrichten. Der Industrieverband BDI reagiert alarmiert. Two committees call for suspension pending independent inquiry into alleged breaches of international law. Le Conseil fédéral n’entend pas changer sa politique concernant les exportations d’armes vers des pays du Golfe impliqués dans le conflit au Yémen. Moins d’un an après sa mise sur cale, l’Elfateh, tout premier exemplaire de la gamme Gowind, nouvelle génération de corvettes lourdes conçue par DCNS, est sorti samedi de son hall de construction à Lorient. C’est aujourd’hui, à Saint-Nazaire, que l’Anwar el-Sadate, second des deux bâtiments de projection et de commandement initialement destinés à la Russie, est livré à l’Egypte. Celle-ci a repris les deux BPC à l’été 2015, juste après l’annulation du contrat signé en 2011 entre Paris et Moscou. C’est une barrière symbolique qui est sur le point d’être levée : l’Union européenne a prévu de consacrer plusieurs millions d’euros, dans le cadre de son budget 2017, au financement de la recherche militaire. L’Arabie saoudite a acheté 60% des armes wallonnes vendues en 2015, selon le rapport de la sous-commission ‘armes’ du parlement wallon sur les licences d’exportation octroyées ou refusées l’an passé, rapporte Le Soir mardi. La Wallonie n’a jamais exporté autant d’armes vers Riyad. This is per the report of the “Weapons” sub-commission of the Wallonia parliament on export licences granted or refused during the last year. China’s People’s Liberation Army Air Force (PLAAF) is set to receive the first four of 24 Russian-made Sukhoi Su-35 ‘Flanker-E’ multirole fighters in 2016, Russia’s RIA Novosti news agency quoted Vyacheslav Shport, the governor of Khabarovsk Krai, as saying during a 15 September visit to the Komsomolsk-on-Amur Aircraft Production Association (KnAAPO). The UK government is under less pressure to suspend defence exports to Saudi Arabia after a parliamentary inquiry into the use of UK-manufactured arms in Yemen failed to reach a consensus. Après une année 2015 déjà florissante pour l’industrie française, New Delhi a signé vendredi un contrat pour l’achat de 36 avions de combat, pour un montant de 8 milliards d’euros. Les soldats français vont bientôt être dotés de fusils d’assaut allemands HK 416 pour remplacer les célèbres Famas, conçus au début des années 1970 et fabriqués pendant trois décennies à Saint-Étienne. Two former British arms manufacturer chiefs have been jailed for paying bribes to secure multimillion-pound contracts for the supply of military equipment to armed forces in Afghanistan. It’s not retaliation against India for its U.S. outreach. Moscow is seeking out new markets in tough economic times. La proposition de la Commission qui vise à améliorer le contrôle des exportations permettrait de moderniser et de simplifier le système afin de faire face aux nouveaux risques. Frankreichs Soldaten werden sich an den neuen Namen erst noch gewöhnen müssen. “Arme Individuelle Future” wird ihr künftiges Sturmgewehr heißen. Abgekürzt: AIF. Das lässt sich etwas holprig mit “Einzelschützenwaffe für die Zukunft” übersetzen. Wegen versuchter illegaler Waffengeschäfte ist ein Hamburger Unternehmer zu einer Bewährungsstrafe von einem Jahr und zehn Monaten verurteilt worden. Le fabricant d’armes liégeois FN Herstal a introduit un pourvoi en cassation contre l’ordonnance du tribunal administratif de Paris. Die Ausfuhr von Fußfesseln und Reizgas wird strenger reglementiert. Auch Medikamente für Giftspritzen sind betroffen – Kriegswaffen jedoch nicht. L’avionneur américain Lockheed Martin, le constructeur du chasseur furtif F-35 de 5e génération, attend avec impatience, comme les autres candidats au marché du remplacement des F-16 belges, le lancement par le gouvernement Michel de l’appel d’offres pour 34 nouveaux chasseurs-bombardiers à livrer à partir de 2023, ont indiqué des responsables de ce géant de l’armement. British-based weapons maker hopes to seal multi-billion pound fighter jet deal – MPs say there is ‘great weight of evidence’ that UK-made weapons have been used to violate humanitarian law. Paris and Belgrade are set to form joint teams to fight arms smugglers, as Serbia remains an important source of cheap weapons for illegal arms traders. Estland hat im Zuge eines Rüstungsgeschäfts mit den Niederlanden die ersten Panzer des Typs CV 9035NL erhalten. Les négociations sur la commande de 50 appareils Caracal à Airbus sont rompues. La Pologne a annoncé mardi l’achat d’au moins 21 hélicoptères américains Black Hawk, après avoir abandonné des négociations sur les hélicoptères Caracal d’Airbus, avionneur européen dont le PDG a estimé “avoir été mené en bateau pendant des mois”. Ce sont des documents du Département d’État américain qui l’ont révélé il y a quelques jours: les États-Unis sont très préoccupés par leur possible implication dans des crimes de guerre commis par l’Arabie Saoudite dans sa guerre contre les rebelles Houthis au Yémen. Russia has completed the delivery of S-300 air defense missile systems to Iran, RIA news agency quoted Russia’s state arms export agency as saying on Thursday. US senators are set to vote on a billion dollar sales of Abrams battle tanks to the autocracy. Report by Saudi investigators finds ‘wrongly passed information’ led to deaths of 140 mourners. Considéré comme moribond depuis l’annulation, en 2008, du contrat algérien pour non tenue des engagements en termes de qualité, le constructeur Mig serait bel et bien en train de renaître de ses cendres avec l’annonce surprise cet été d’un contrat de 2 milliards de dollars pour la livraison à l’Egypte de 46 Mig 29M, dans le cadre de l’accord d’armement de 3,5 milliards de dollars signé en avril 2015 entre Poutine et Sissi. Le secrétaire d’Etat britannique chargé du Moyen-Orient, Tobias Ellwood a annoncé que son pays étudie, avec sérieux, l’arrêt des exportations d’armes vers l’Arabie Saoudite. L’intervention du Conseil fédéral sur un dossier lié à l’industrie de l’armement dénote des divergences entre le Département fédéral de l’économie et celui des Affaires étrangères, révèle lundi la Luzerner Zeitung. Theresa May has failed to assure MPs that civilians have not been killed by British manufactured bombs dropped by Saudi Arabia on Yemen. Following the extreme violence and fighting in July 2016, the EU’s High Representative, Federica Mogherini, issued a declaration on South Sudan. The EU reiterates its call on all South Sudanese parties to implement the Agreement on the Resolution of the Conflict in good faith. Britain and France today awarded a contract worth some €150 million ($164 million) to Thales, leader of an Anglo-French industrial team that will build two prototype unmanned mine hunting units under the bilateral Maritime Mine Counter Measures project. BAE Systems has been awarded a new contract for its Advanced Precision Kill Weapon System (APKWS) laser-guided rockets that is likely to boost the company’s production numbers beyond current rates. The Ministry of Defence has backed down from a confrontation with industry over fears a £3bn contract to build a fleet of armoured vehicles could be awarded to a German company without going out for tender and with none of the work carried out in the UK. The Middle East has become Finland’s most important market for arms exports. According to a new report by the think tank SaferGlobe Finland, local arms manufacturers sold some 99 million euros of mainly armoured vehicles and mortars in 2015, the bulk of it to countries outside the European Union. Trotz laufender Ermittlungen: Der Waffenhersteller plant weiter mit Investitionen in Milliardenhöhe. Germany’s ammunition exports skyrocketed in the first half of 2016, a leaked report has revealed. Turkey, currently suppressing its political opposition, has moved up the list of the country’s best customers. Lithuania has agreed to buy the Norwegian Advanced Surface-to-Air Missile System (NASAMS) from Norway, the Lithuanian Ministry of National Defence (MND) announced on 21 October. Deutschland exportiert weniger Kleinwaffen, aber sehr viel mehr Munition. Außerdem: mehr Lieferungen von Flugzeugen, Fregatten und Kampfpanzern in Länder wie die Türkei und Saudi-Arabien. So lässt sich Rüstungsexportbericht für das erste Halbjahr 2016 zusammenfassen. Swedish prime minister, Stefan Loefven, has faced criticism after visiting Saudi Arabia with the chairman of Sweden’s largest arms manufacturer and making flattering comments about the country’s treatment of women. Boris Johnson has claimed other Western countries would “happily supply arms” to Saudi Arabia without the same protections should Britain suspend its sales. Memo of understanding with Polska Grupa Zbrojeniowa covers development of Polish naval programs. Die Bundesregierung hat in den ersten sechs Monaten diesen Jahres Einzelgenehmigungen für Rüstungsgüter im Wert von gut vier Milliarden Euro erteilt. An EU, Nato und Nato-gleichgestellte Länder gingen davon 42,5 Prozent. In May 2015, with Russia’s war still going on against eastern Ukraine, five Oplot-M tanks rolled out of the Malyashev tank factory in Kharkiv, ready for service in the army. A date has been set for a High Court court challenge that could halt British arms sales to Saudi Arabia – amid mounting accusations the country is committing war crimes. Pünktlich zur Vorlage der frischen Quartalsbilanz des größten deutschen Rüstungskonzerns Rheinmetall am kommenden Montag (31.10.) prangern Menschenrechtler und Investigativmedien die Exportpraxis des Düsseldorfer Unternehmens an. Guardian/BBC investigation finds that blue-chip manufacturer may have benefited from use of alleged payments by network of intermediaries for year. Billionaire Sudhir Choudhrie has been welcomed by the British establishment. The Turkish government has confirmed its second order of F-35s from US prime contractor Lockheed Martin, even as Turkey is tilting toward a ruling style that more closely resembles Russia than Western governments.